...or, it could just be other planets conserving energy. Today marks the beginning of Dark Skies Awareness week, timed just right for Earth Day/Week. This project is one of the 11 Global Cornerstone Projects during the 2009 International Year of Astronomy, with its goal to raise public awareness of the adverse effects of excess artificial lighting on local environments. That's too much light in our skylines, drowning out the stars; or street lighting that doesn't really light the streets, as much as it does the sides of buildings; or major venues that continue to use floodlights when not needed. All of it contributes to light pollution. And speaking of a light going out...a couple of years ago, the New-York Historical Society produced an exhibition called A New Light on Tiffany, where they highlighted the work that the Tiffany Girls did. Led by Clara Driscoll, these were the women who picked and cut the glass for the Tiffany windows, shades, and mosaics. Though she was known for her Dragonfly design (the dragonfly being an ancient Japanese symbol of new light and joy), Clara designed the famous Wisteria pattern as well. 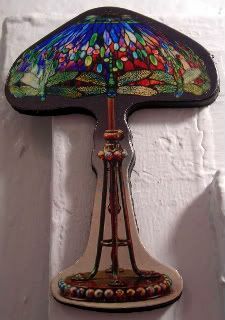 It was a great exhibition of the Tiffany studios work - where several of the lamps were displayed. All gorgeous, lit, and unlit - some of them not having seen the light of day in decades. It was fantastic. Loved it - even if, at the end, this woman, who was clearly a driving force behind Tiffany, had to quit the second she got engaged in 1909. Company policy: Married girls couldn't work for Tiffany. Ugh. Just ugh. Who knows if the light went out of her life afterward - maybe she was tired of working on Tiffany's designs without very much credit. Maybe she was happy with her husband. I guess, but it's still kind of annoying that she had to give up her glass career in favor of a husband, and a career painting scarves.